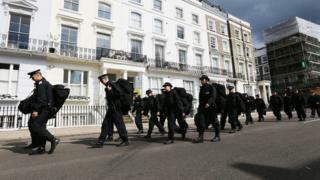 Some police officers "dread" the Notting Hill Carnival and are being used as "professional punchbags", according to rank-and-file officers. They have called for a "full-scale review" of Carnival after eight of them were hurt and taken to hospital. Police made 454 arrests and four people were wounded in stabbings during the annual celebration. Ken Marsh, chairman of the Metropolitan Police Federation, said the event was being "hijacked" by troublemakers. He said: "Last year we had an officer stabbed. This year colleagues were assaulted, abused and spat at. Forty-three were injured - with eight needing hospital treatment. How can that be right? It's completely and utterly unacceptable. A 15-year-old boy was stabbed in Wornington Road on Sunday. His injuries were critical but are now non-life threatening. A 14-year-old boy was arrested. Three other males, aged 15 to 20, were also wounded in knife attacks on the opening day of the festival. More than 400 people were arrested at Carnival, the highest since 2008. Police said they had seized 90 offensive weapons while patrolling the event. Officers also seized a large canister of compressed nitrous oxide - so-called laughing gas - which had the capacity to fill 2,500 smaller canisters and had a street value of more than £150,000. Ambulance and first aid crews treated more than 1,000 people, mostly for alcohol-related injuries. A spokesperson for the London Mayor said his office would work to tackle gang and knife crime, and City Hall would "thoroughly review" the Carnival. Kensington MP Victoria Borwick said she was "very disappointed that people want to spoil the carnival by using it as a cover to commit crime and inflict terrible injuries". The carnival is one of Europe's largest street parties with hundreds of thousands attending each year. It has been held since 1964 as a way for Afro-Caribbean communities to celebrate cultures and traditions.